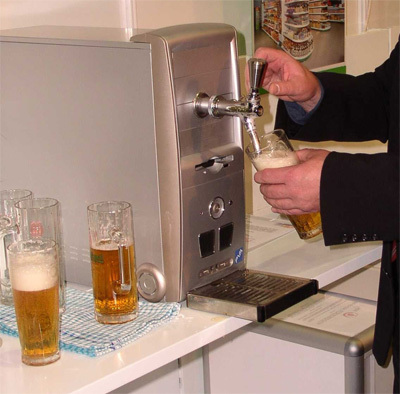 A Beer Dispensing PC | OhGizmo! If a beer dispensing case mod is not the most incredible and delicious hack known to man, then I don’t know what is. What hurts is that there precious little information on this. A picture, and a couple of links to an Italian website, and uh, a Slovakian (? ?… well, it ends in .sk) website. Pair this with Magic Fridge and you could ensure a swift death from alcohol poisoning. Is there an upcomig OhGizmo contest where you will be giving one of these away, David? A unique way to employ “liquid” cooling of the CPU. Nobody ever said it “had” to be recirculating. “Honey, I’m just trying to keep the CPU cool by flowing liquid over it”. Wow! The coolest thing I’ve ever seen. Not the beer thing; Where do I get pictures of supermarket aisle-ends to put in my den?!? Do you suppose it’s beer cooled : )? if the beer is cooling ur computer, then the computer is warming the beer! Awesome. but beer tastes bad, so let pput in like soda.